The VX-5HD is taking optical performance to a whole new level. 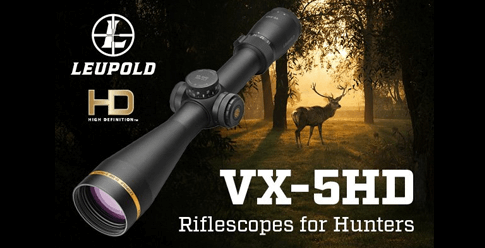 Leupold gave it a High-Definition optical system for sharp clarity, and the Twilight Max™ Light Management System for great low-light performance, giving hunters a visible advantage at dawn and dusk when game is on the move. Models with CDS-ZL2 (Custom Dial System ZeroLock 2) elevation dial locks in place so it cannot be inadvertently rotated off zero. A mere press of the button, which also acts as a revolution indicator, will allow the user to dial up two turns of elevation, if necessary. Models with covered popup elevation and windage dials provide fast and accurate sight-in and easy rezero. All VX-5HD CDS-ZL2 riflescopes include one free Custom Ballistic Dial with purchase. FireDot illuminated reticles provide daylight bright, red dot-like performance with an easy to use 1 button intensity adjustment. All VX-5HD scopes include bungee style lens covers and Guard-ion lens coatings that shed water, dirt, and fingerprints. Available accessories include Alumina Flipback Lens covers and a reversible throw lever.